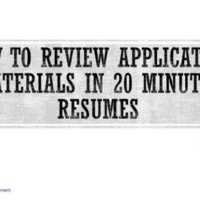 Student Leaders, wondering how to review an resume in 30 minutes or less? Join the OCPD for an interactive workshop that will teach you how to quickly assess and identify the most common mistakes made in resumes in 30 minutes or less. This session will focus on resumes and cover everything you need to know to give useful feedback within a designated time limit. ​Snacks will be provided during this session.